After all the hype I decided to try out the new Apple web galleries so I uploaded my first album. The upload speed seemed pretty sluggish as did the loading of the actual album on visiting the web page. Presentation on the website is superb though and it’s a great way of showing off your photo’s. One of the nicest ways of viewing the album is using the carousel. This is like coverflow in iTunes and allows you to scroll through the pictures. Only annoyance is it takes a while for pictures later in the album to get the high res sharper version of the photo so you can spend a while looking at fairly fuzzy pictures. Another feature I like is that as you move the mouse over the album photo in the gallery page it flicks through the images in the album – very slick and mirrors the functionality seen in iPhoto. While many have seen this as a Flickr competitor for me they are two different beasts. .Mac Web Galleries allow you to easily upload albums of photo’s (and also video’s) and let your friends view or download them. Flickr lets you do the same but with far more disk space and has a whole community supporting it with forums, groups and commenting. 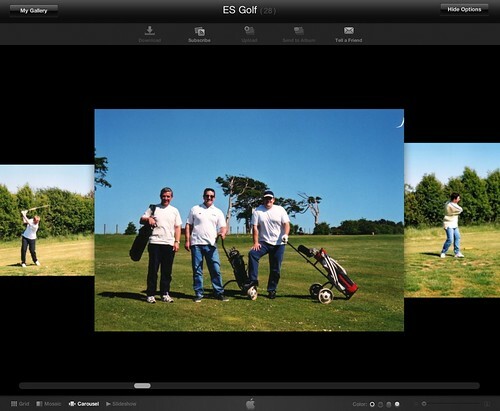 It also has far stronger tools for editing sets, albums and also supporting geo-tagging. One feature that .mac has got is photo uploading – letting people upload photo’s to your album which then sync back to iPhoto. I find that pretty odd as thats something I don’t think I would ever use. Due to space and speed alone I’ll be sticking with Flickr – be nice to see them up their game when it comes to presenting albums though.